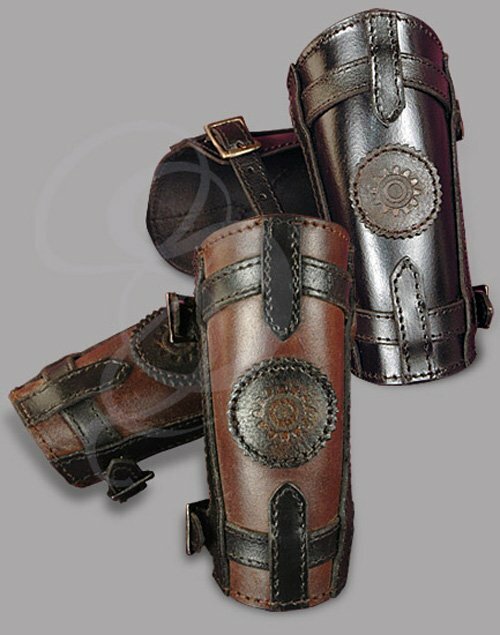 A High Quality Pair of Bracers Made in Denmark! Who says warriors are the only ones that need armor? When you're a battle mage on the move, you've got to be able to fend off a couple of sword blows before you can execute the moves that your class is known for. That goes for rogues, bards, rangers and any other unusual profession. These bracers are ideal for any mysterious costume or character class. They add a perfect accent to any costume, and make great conversation pieces. They are astoundingly rugged and bear a stylized starburst symbol on the cuff. Two thick, adjustable straps hold the bracers tightly onto your arm. They are available in black or brown. These bracers are a part of our "Standard Leather" collection. These bracers are meant to be affordable while still retaining many of the best features of their ultra high end "LeatherWorks" collection. Craftsmen use a proprietary coloring technique to bring out the highlights of the leather and to apply the richest colors possible. The designs are relatively simple to keep cost down, but the result is still better than most bracers on the market today. These bracers are years ahead of most of the competition. While others are busy trying to hide rivets and spikes needed to cinch the leather together, our crafters have moved on to bigger and better techniques. They have abandoned these crude, cheap methods for crafting leather goods and have switched to 100% stitched materials. This gives much more authenticity and quality to their materials and is more in keeping with the time-honered techniques of leatherworking. Each of these bracers is rigorously tested and quality controlled. You will not find more consistently high quality craftsmanship on mass-market leather goods.